United Nations Security Council is one of the six main organs of the United Nations (UN) established by the UN Charter. The Security Council is created to maintain international peace and security, and it is equipped with special powers. The Security Council has 15 members, 5 of them being permanent members which have the right of veto. The Security Council’s resolutions have a binding nature that obliges the Member States to comply. In order to settle a dispute by peaceful means, the Council may recommend terms and methods of settlement, and ultimately it can impose sanctions and authorize the use of force to maintain or restore international peace and security. 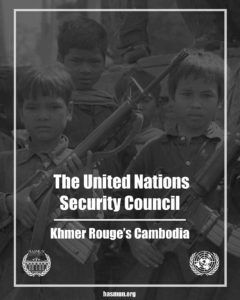 During the Khmer Rouge period in Cambodia, the Security Council had its most strenuous debates to decide the future of this regime and tried to overcome the heaviest ethnic and political conflict within the country. Delegates in the Historical Security Council will have the chance to restore the security and sustainability in Cambodia prior to the crimes against humanity of surreal brutality.